Light weight FS XC bikes – are there any that dont have a steep HA ? This topic has 26 replies, 22 voices, and was last updated 2 months ago by cokie. I’ve been looking for a lightweight bike for my wife, XC FS. All the ones I can see seem to have a very steep HA. These are going to be twitchy and not really provide any confidence when the trail turns techy or goes downhill. Also most of the XC ones don’t seem to come with a dropper, which isn’t good. Anyone got any suggestions ? Lots of trail bikes, but these are overkill for her type of riding. I’m thinking a 120mm sort of bike would be perfect. Lighter than her current Scott Spark 730. What do you count as ‘very steep’? Well I suppose 70ish. Something around 66ish would be a good starting point. Or something with that level of confidence inspiring stability. Edit – this was the bike I was hoping the mag was going to get in when they tested slack xc bikes. So someone get one please and tell us all about it so I can add it to the dream bike list! The issue is that light weight tends to also mean less strength. Manufacturers therefore avoid this. Blur with a 120mm fork would be 68 degrees? Scott Sparks are 67 now if she otherwise likes the bike? Spend a bit more to reduce the weight? Yeti SB100, (67.8 with a 120mm fork) then Angleset if not enough? Is it for racing or riding? As above some people have done race bikes with longer forks for slacker more fun but still light weight bikes, Rocky Element BC editions as an example. Anthem 27.5 67.5 HA with 130mm fork. Orbea Oiz 19 is also 68 for the trail version with 120mm. Spendy though. Anthem up there would seem to be the perfect solution. Closest you’ll get, that I know of, is an Intense Sniper or a Pivot 429 Trail. I’ve the Intense & if you do a search on STW you’ll find my review. Long story short: I think it’s a great bike. I will have a look at those suggestions. What she needs is a bike for riding that is light and confidence inspiring. I’m not sure why race bikes seem to have steep HA’s. Is it a marketing thing ? Does the twitchy feel give you the impression its fast ? My newer Scott Spark is great on descents (around 68deg), but to be honest my missus has no trouble on her Topfuel (69.9deg I think?). She’s done stuff like Jacob’s Ladder and other steep stuff on it with a dropper. My guess is that proper XC race bikes are optimized to climb without much concern for descents. IME, as a rule-of-thumb, you spend twice as long climbing as you do descending, so losing a bit on the descents is worth it to gain a bit on the climbs. Pro XC racers have much better bike handling skill than most amateurs, so what feels sketchy to an amateur is much less of a concern to them. An XC race bike is not a very good trail bike for an amateur, but people still buy them because that’s what the pros race. I have an old 26″ Anthem with 130mm U-Turn Revelations. It’s a much improved trail bike over the original 80mm Rebas. My guess is that proper XC race bikes are optimized to climb without much concern for descents. IME, as a rule-of-thumb, you spend twice as long climbing as you do descending, so losing a bit on the descents is worth it to gain a bit on the climbs. Spot on really, so long as you stay on it the climbing time will pay you back, I miss my old XC bike to a point, that point being that I never took it out unless I was getting sorted for a race and wanted to get my eye back in. It would much through the miles so well and if you were on your game get down or across a lot more than you ever expected just with a much finer margin for error. That part was fun to a point!! look for a 2017 Scott spark 700 plus contessa. This was the ‘nail on the head’ bike for light, fast and great for descending. 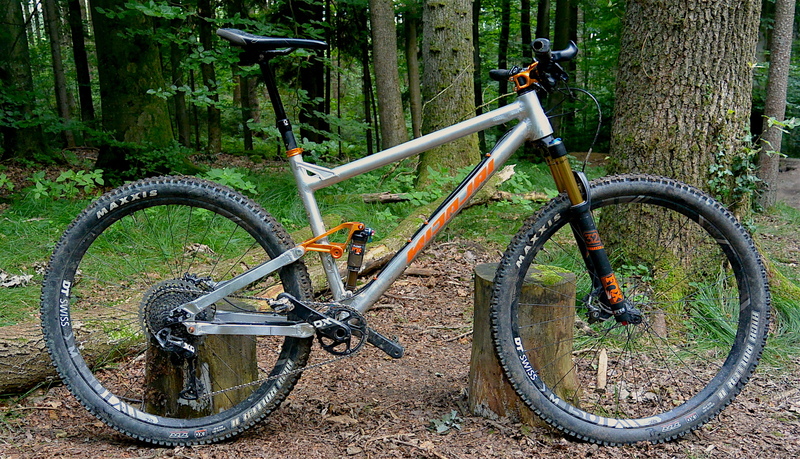 No longer available in this iteration now..
Whyte T130 would fit the bill nicely. Or a Evil Following MB. BMC Fourstroke is 67.5 nice looking bike as well. If it not for xc racing then how about Bird Aeris 120. More a short travel trail bike that pedals well than an out and out xc machine. It descends very well. Edit: I think the length of the bike adds to it’s confidence inspiring ability. Have you ridden one of these awful steep angled bikes? My XC bike has a 70.5 degree head angle. But it also has a wide bar, big wheels and a dropper. It’s not twitchy. Exactly. Perceived twitchiness is a factor of head angle and fork rake. A 70 degree bike does not mean a twitchy bike at all. Not an xc bike as such but would also suggest a Bird Aeris 120. Good geometry and would fit the bill with light kit on it. Perceived twitchiness is inherently a personal view. The steering geometry has a bearing on it but the rider is more important. Furthermore fork rake is fixed within a narrow range on bikes with suspension forks, so a 70 deg head angle would be considered twitchy by a rider such as myself whose steepest MTB is under 67 deg at sag and the slackest sub 65 deg with big wheels and short fork offset. If you’re used to road bikes or BMXs then I’m sure you wouldn’t find an XC race bike from a few years back at all twitchy but many of us would. Whyte S120 has a 65.5′ headangle!